WOONSOCKET, R.I. — CVS Health has taken its efforts to fight the abuse of opioids to New Hampshire. CVS said Wednesday that it has installed safe medication disposal units in two CVS Pharmacy locations in New Hampshire to foster proper and timely disposal of opioids and other medications that could be diverted or misused if left in people’s homes. In addition, CVS allocated more than $60,000 in funding to three New Hampshire nonprofit groups also working to prevent opioid abuse. The CVS drug disposal kiosks have been installed inside 24-hour CVS pharmacies at 242 Main Street in Nashua and 268 West Street in Keene. CVS noted that these kiosks supplement the 15 other medication disposal units it has donated to police departments across the state. Nationwide, CVS has donated more than 850 units to police departments, collecting more than 140 metric tons, or 300,000 pounds, of unwanted medication, the company reported. Meanwhile, CVS contributed over $60,000 to programs that address and prevent opioid abuse in coordination with SOS Recovery Community Organization, Hope on Haven Hill and Concord Hospital. SOS Recovery Community Organization received $20,000 from CVS to build capacity for current peer recovery coaches as well as recruit, train, and certify new recovery coaches to better serve individuals seeking services in Strafford County. Hope on Haven Hill, which serves homeless, pregnant and newly parenting mothers who are in recovery, received a $10,000 grant from CVS Health to train staff and volunteers to assist New Hampshire women obtain recovery and find new coping skills while becoming a new parent. And Concord Hospital Trust received a $30,000 grant to further implement consistent SBIRT (Screening, Brief Intervention, Referral to Treatment) screenings in their Concord Hospital Medical Group primary care practices. 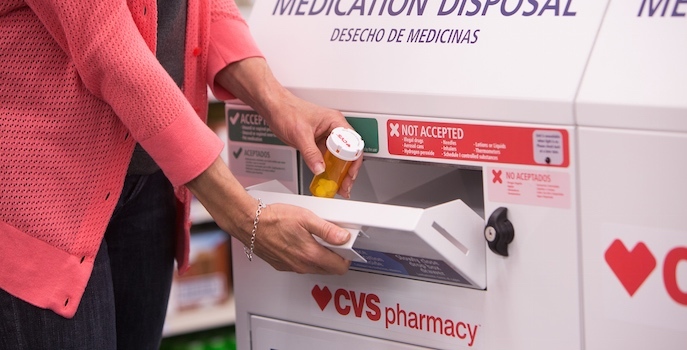 Overall, 750 CVS Pharmacy locations across the U.S. now have safe medication disposal kiosks. CVS Health also said it would enhance opioid utilization management aligned with CDC Guideline for CVS Caremark clients and members, complementing measures already in place, and continue to broaden access to the opioid overdose antidote naloxone, which is available at CVS pharmacies without a prescription in 46 states, including New Hampshire.